The black infused colour of the StoVentec Glass was installed on the new extension to the National Museums Collection Centre in Granton, Edinburgh. 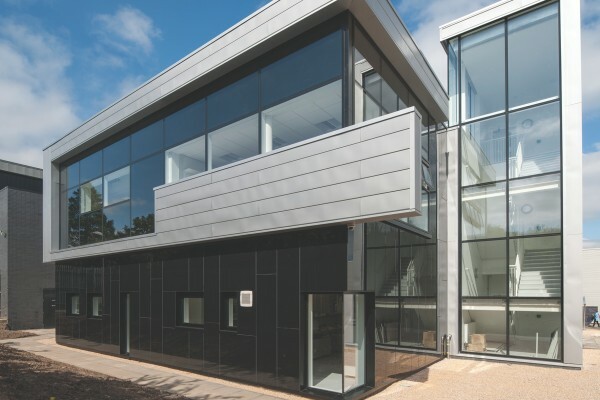 When used as an external rainscreen cladding system, StoVentec Glass provides effective thermal insulation for the façade by creating a ventilated cavity which keeps the wall dry and allows it to breathe. It can also be used to create a highly attractive bespoke finish for each individual project, with panels sizes and shapes manufactured to fit specific design requirements. StoVentec Glass can also be used as an internal decorative option. The StoVentec Glass panel has a reaction to fire classification of Class ‘O’ (England, Wales & Northern Ireland) or ‘low risk’ (Scotland) as defined in the documents supporting the National Building Regulations. StoVentec Glass is also supported by full BBA certification (Certificate 10/4792) and has extensive impact and blast testing approvals. The National Museums Collection Centre is an internationally significant facility for the research, conservation and storage of Scotland’s wide-ranging national collections. The new development will enhance the space and scope for scientific, conservation and research activity at the Centre.